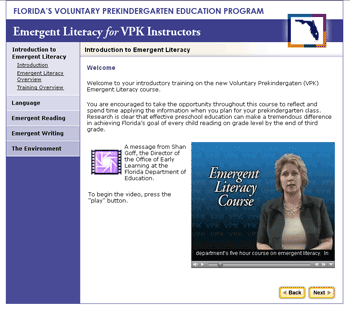 The goal of the five-hour Emergent Literacy Course for VPK Instructors is to provide participants with background information on emergent literacy and demonstrate instructional practices that can be used in VPK classrooms. This training is designed to follow the initial training on the new VPK Standards. The online version of the course is offered through the Department of Children and Families (DCF) online child care training system. If you have not yet used the DCF online child care Training system, please view the following walkthrough of how to register for an online course using this system. For additional information, please contact the Department of Education, Office of Early Learning 850-245-0445, or your VPK regional facilitator. For technical support, please contact support@fcim.org or call (800) 357-1072.